The African nation of Nigeria is experiencing many familiar problems in our age of climate change: rising sea levels, storm surges, devastating flooding. 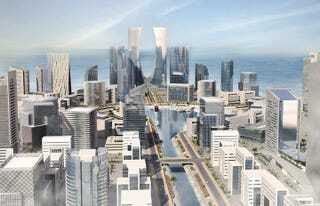 Now its coastal city Lagos is going to outrageous lengths to protect itself, both environmentally and financially, by building an entirely new city the size of Manhattan between it and the ocean. The multi-billion-dollar Eko Atlantic development claims it will safeguard against coastal erosion, "transform[ing] land lost to the power of the sea into an ocean-front city that will be one of the wonders of the 21st century." It also bills itself as the economic catalyst that will nudge Lagos into the category of a truly global megacity, making it the "new financial epicenter of West Africa by the year 2020." Eko Atlantic is where you can begin to see a possible future – a vision of privatized green enclaves for the ultra rich ringed by slums lacking water or electricity, in which a surplus population scramble for depleting resources and shelter to fend off the coming floods and storms. Protected by guards, guns, and an insurmountable gully – real estate prices – the rich will shield themselves from the rising tides of poverty and a sea that is literally rising. A world in which the rich and powerful exploit the global ecological crisis to widen and entrench already extreme inequalities and seal themselves off from its impacts – this is climate apartheid. Developers are currently finishing construction on the artificial island the city will sit upon, including a 1.8 mile-long seawall dubbed the "Great Wall of Lagos." It is one of the largest civic engineering projects in the world. Meanwhile, the official website for Eko Atlantic promises a walkable community with office towers, parks, and outdoor restaurants. There's a marina that would be not at all out of place in an episode of Miami Vice. A "spectacular central boulevard... similar in size to the Champs-Élysées in Paris or Fifth Avenue in New York" will run down its center. There will be housing for 250,000 residents and jobs for 150,000 more. The Makoko slum—where people live on boats and stilted homes in a lagoon—is only about a mile away from Eko Atlantic. Parts of this slum and other communities like it have already been demolished or forced to relocate due to development. Some claim that Eko Atlantic's construction and dredging have even made the coastal surges worse for these floating neighborhoods. While a barrier island would likely help protect the city from a storm surge (we've seen similar solutions proposed for New York City), this particular idea of a massive privatized development designed for millionaires and their corporations seems particularly insensitive to solving the larger issues around climate change and inequality in Lagos. Update: An earlier version of this story mistakenly reported that 70 percent of Lagos's residents live in floating slums, when in fact, about 100,000 residents do. According to UNICEF statistics, 70 percent of Nigerians live below the poverty line.